I used a few of different types of squash in this recipe. 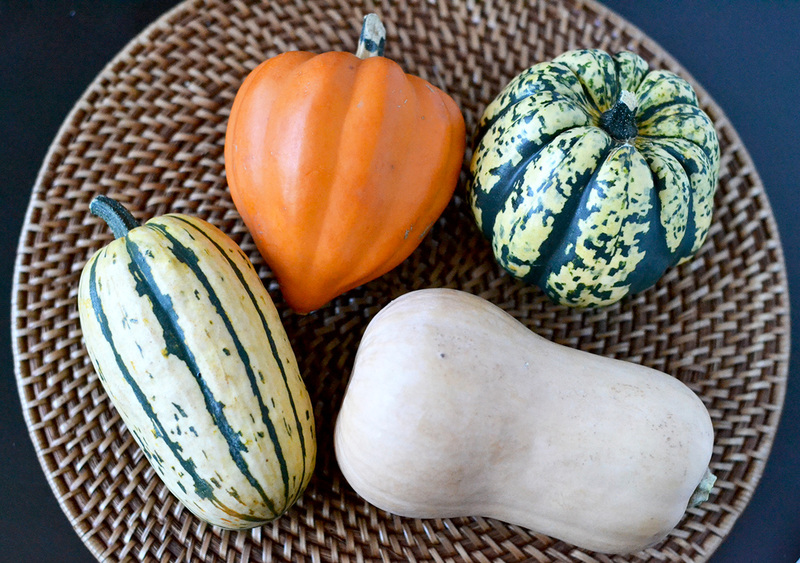 Almost any variety will work but cooking times tend to vary somewhat by type of squash – I learned this the hard way. If you don’t mind having some squash pieces slightly softer than others, then go ahead and roast all of your different varieties of squash together. I like butternut (the classic) and delicata the best. Orange acorn works well too but I recommend staying away from carnival squash. It’s very difficult to cut and cooks slower than the others. To learn more about winter squash, check out this helpful visual guide from Epicurious. After peeling, scooping, and cutting these small squashes into bite size pieces. I baked them in the oven with just a little olive oil (so they don’t stick to the pan) fresh sage leaves, salt and pepper – much like the beginnings of the classic preparation. The fun starts when the squash comes out of the oven. Nutty brown butter mixed with apple cider and apple cider vinegar creates a buttery sweet yet tart dressing. 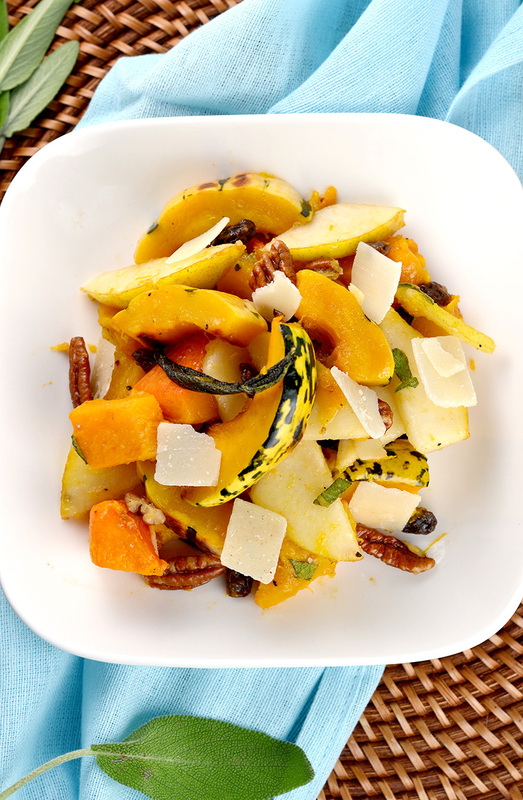 Toss with sliced pears, pecans, and raisins and ordinary squash becomes an delightful Autumn side…or maybe even a meal by itself. Preheat oven to 400 degrees. Grease or line a baking sheet with parchment paper. 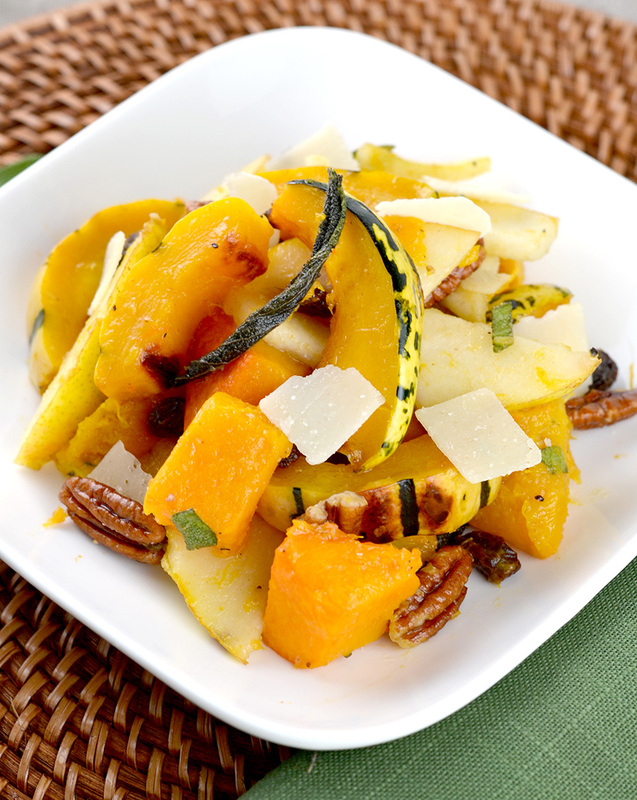 In a mixing bowl, toss squash with olive oil, salt, and pepper. Place on baking sheet in one layer. Sprinkle sage leaves on top of squash. Bake 30-35 minutes or until squash is soft when pierced with a fork. Briefly cool. While squash cools, make the dressing: heat butter in a small saucepan or sauté pan over low heat until butter begins to foam and turn a hazelnut color (the butter should also smell nutty) – about 5 minutes. Remove from heat. Whisk in apple cider then cider vinegar. Season with salt and pepper. Peel, core, and slice pears. In a large bowl combine squash, pears, raisins, and pecans. Drizzle brown butter dressing over top. Toss to combine.